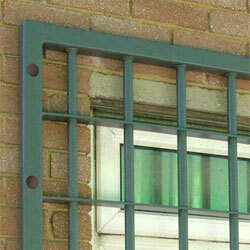 Certified Steel Security Door Systems, Louvre Systems and Security Grilles. Sunray are leading UK Designers, manufactures and installers of Steel Commercial Doors, Fire Doors, Certified Security Doors, Industrial Doors and Steel Louvre Systems. The comprehensive Sunray product portfolio provides bespoke solutions for a variety of project applications through innovative design, technical expertise and dependable quality and service, all of which is based from our site in Ashford, Kent. Sunray’s continued R&D programme has successfully enabled its product offering to be recognised by the loss prevention certification board (LPCB) and loss prevention standards (LPS) security rating performance accreditation, meeting standards 1175 Issue 7,levels 1-6. This endorsement is testament to the ethos of Sunray which is to provide continuous improvement and deliver above expectation. the UK with the ability to react and meet today’s project demands, offering bespoke product solutions in as little as just 15 days or sooner when using the FastTrack service. The Loss Prevention Standards, developed by the loss prevention certification board LPCB, addresses risk not otherwise covered by existing national and international standards and codes. They are drafted by teams of experts, and are reviewed and endorsed by independent stakeholders representing major interest groups. 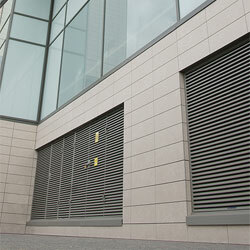 Sunray Steel Security Doors, Louvre systems and Window grilles tested to the LPCB’s security standards have been subjected to the simulation of a variety of attack scenarios. 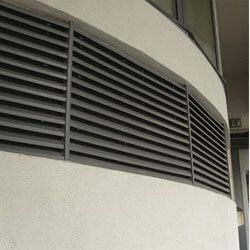 The tests are held at the BRE (British Research Establishment) and are undertaken by professionals who replicate a sustained ‘intruder’ attack. 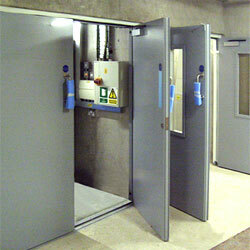 Sunray Steel Security Door range, tested and certified by the LPCB to LPS 1175 issue 7, from security levels 1-6. The ExcluLouvre® Door range of steel security louvre doors are security-rated by the LPCB to LPS 1175 issue 7, security levels 2 & 3, combining strength with excellent airflow characteristics. The ExcluLouvre Door is fully compatible with ExcluLouvre product range. The ExcluLouvre is fully compatible with the ExcluLouvre Door range. The ExcluGrille® range of window grilles are security-rated by the LPCB to LPS 1175 issue 7, security levels 3 & 4, providing exceptional resilience against experienced attempts at forced entry to a building. 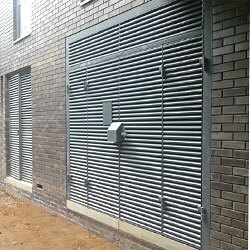 ExcluWall® provides an integrated Steel louvre wall and door combination, security-rated by the LPCB to LPS 1175 issue 7, to security levels 2 & 3; bespoke designed and manufactured to fit any virtually any up to 5 metres in height and no restriction in width.